Retail $11.00 SAVE 20% ! This light gray primer has excellent coverage and is recommended for use prior to painting a light color onto a darker colored material. Works on plastic or metal. I&apos;ve been building models for over 45 years, and Tamiya primers have become my favorite as far as spray can primers are concerned. The Surface Primer and Fine Surface Primer cover well, spray on smooth, dry quickly, and sand like butter. Most importantly, the long term topcoat holdout is excellent. I&apos;ve used these primers over all kinds of styrene and never had any issues with it attacking the material. I&apos;ve used other brands that might have had slightly better filling properties, but its worth using a couple extra coats with the Tamiya products because they perform so well overall. 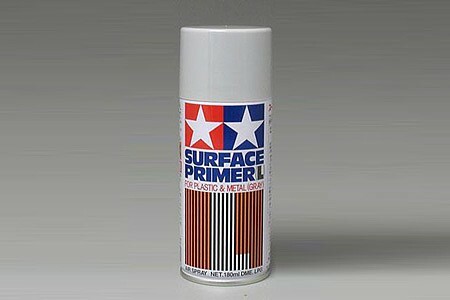 One of if not the best spray primer you can buy. Use outdoors or in a well-ventilated area. Great coverage and very easy to use. The only drawback is the size of the can.